If you spend any time in the outdoors chances are you probably need insect repellent. Here in New England ticks and Lyme Disease are huge problem and we have mosquitos that are as savage as piranha. Both can take the fun out of any outdoor adventure. The deer ticks can ruin your life. I carry spray on tick repellent in both of my vehicles and that works well. That said though often times sprays and liquids do not lend themselves to traveling, hiking, camping, backpacking, mountain biking and nature photography. This is where Ben’s 30% DEET Mosquito Tick and Insect Repellent Wipes comes into play. 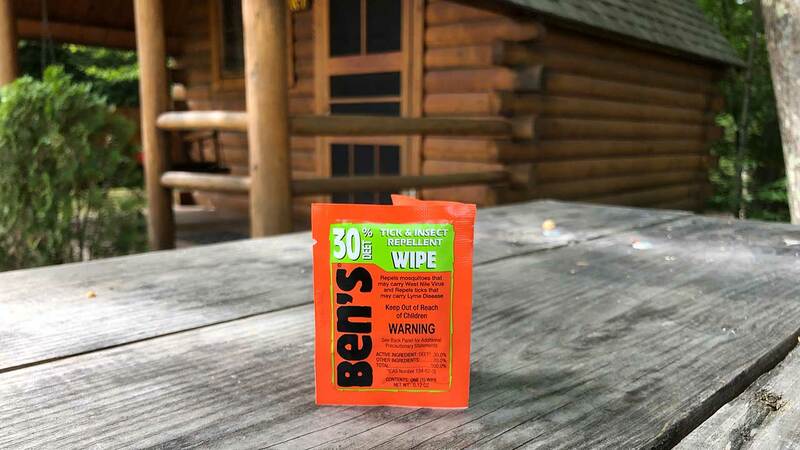 The Ben’s 30% DEET Mosquito Tick and Insect Repellent Wipes are so convenient that they can be packed anywhere as they weigh next to nothing and fit anywhere. I pack them in my mountain bike saddle bag, camera backpack, hiking backpack, back pocket, shirt pocket whatever. The point is there is no reason not to take the Ben’s 30 wipes with you. Be sure to read the instructions on where and how to apply the repellent! 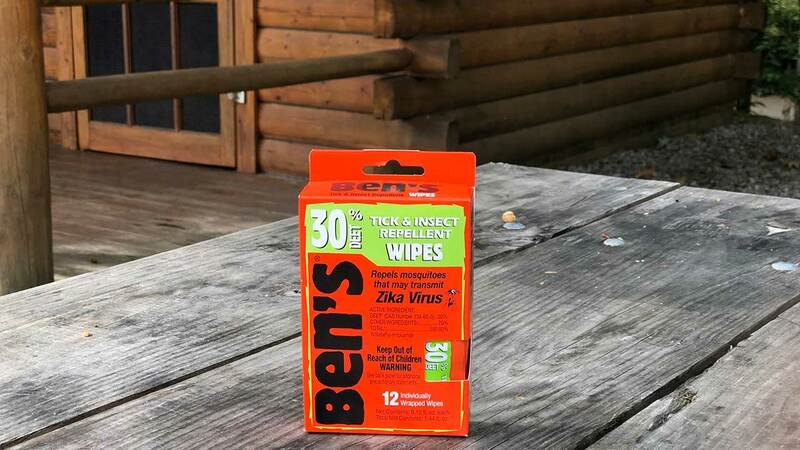 How Well Do Ben’s Insect and Tick Wipes Work? DEET is currently the best insect repellent available to consumers and Ben’s works as well as any other DEET based product. DEET has been around since 1946 so that should be somewhat an indicator of its performance and safety when used properly. It’s important to note that the percentage of DEET does not reflect strength or potency. It instead refers to how long it will last when applied. 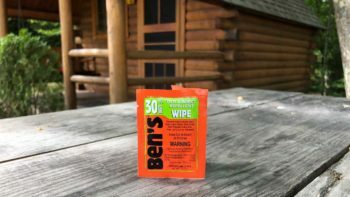 According to the manufacturer Ben’s 30% wipes should repel insects for 2 hours and that sounds about right. Some folks mention clothing being stained. I can’t verify that because most of my outdoor clothing is already stained. Regardless who cares. I would rather a stained shirt collar than Lyme disease. No brainer right? 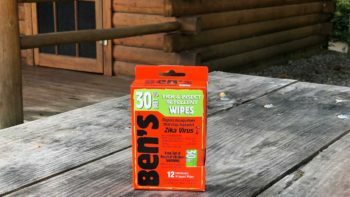 The Ben’s 30 insect repellent wipes are water based and the reasons for that are listed further down this page. There’s an additional benefit than those listed. If it was alcohol based it wouldn’t go very far. It would evaporate like eyeglass wipes. Being water based you can cover a lot of territory with a single wipe. There’ a mild smell but it’s really nothing. Admittedly these types of smells do not typically bother me. Like I stated at the top of this page it works as well as any other DEET product. It doesn’t keep you from getting buzzed by insects and ticks can still land on you as you walk through grass but they don’t seem to stick around. Also with regards to ticks typical precautions should still be taken in how you dress. I also wipe down my shoes, backpack anywhere it gets near skin. I even stick the used wipes to my gear and hat like insect repellent flags lol. Ben’s 30% insect repellent wipes work well when used as instructed. I still suggest dressing for protection. I do not see the wipes giving a person the ability to hike naked through the woods, though I’m not opposed to the notion. The wipes ultra portable and packable. I have read comments that because they are wipes they are even allowed on planes. I guess that appeals to folks flying to destinations where insect repellent is unavailable, or if you fear the people in the seats around you might have cooties or bed bugs, though neither of those are listed on Ben’s site. The wipes are very inexpensive, I get them at locally at REI though Walmart and the local pharmacy carry them. I also buy them on amazon if I’m ordering something else. Ben’s 30% DEET Mosquito, Tick and Insect Repellent Wipes offers protection from ticks and insects that may carry the Zika Virus, West Nile Virus (WNV), Lyme disease, Malaria, Eastern Equine Encephalitis (EEE), and other infectious diseases. Providing up to 8 hours of effective protection, Ben’s® 30’s unique 30% DEET, water based formula is made to evaporate slowly – so repellent stays on longer with little absorption into the skin. Individually wrapped wipes let you control the amount and location of repellent to apply. Individually wrapped wipes let you control the amount and location of repellent to apply. CDC-Recommended Formula: 30% DEET is the minimum % recommended to guard against diseases transmitted by insects including the Zika Virus, Lyme Disease, West Nile Virus, and Eastern Equine Encephalitis. Fragrance Free: Smell the great outdoors, not your repellent. Portable Protection: Individually-wrapped and easy-to-apply wipes are perfect for packs, pockets, or purses. The Best Deet Formula for your Skin: Water-based formula stays on skin’s surface rather than being absorbed. How long does Ben’s Tick & Insect Repellent last? Although insect repellents work differently on everyone due to body chemistry and other factors such whether you are sweating, their studies show that Ben’s 30 Tick & Insect Repellent provides two hours of protection and Ben’s 100 Tick & Insect Repellent provides 10 hours of protection or more. Why does Ben’s 30 Tick & Insect Repellent use water instead of alcohol as most other DEET insect repellents do? They replaced alcohol in Ben’s 30 Tick & Insect Repellent because water does not evaporate as quickly as alcohol, and does not open the pores; therefore it is a longer lasting formula that does not need to be reapplied as frequently. Alcohol also creates a strong aroma providing the traditional “insect repellent” smell. The water-based Ben’s 30 Tick & Insect Repellent formula does not have a scent that is as strong as some alcohol based repellents. What is the difference between Ben’s 30 Tick & Insect Repellent and Ben’s 100 Tick & Insect Repellent? Ben’s 30 Tick & Insect Repellent contains 30 percent DEET and is the amount recommended by the CDC for protection from disease carrying insects. Studies show that 30% deet provides up to 6 hours of protections making it a perfect choice when hiking, camping or enjoying other outdoor activities in areas of light to heavy insect infestation or whenever ticks may be present. Ben’s 100 Tick & Insect Repellent contains 98 percent DEET, the highest concentration — and therefore one of the longest lasting DEET formulas available from any manufacturer. It is recommended for use in areas of heavy insect infestation and studies show that it will provide up to 10 hours of protection against biting insects and ticks. Will DEET based repellents damage nylon materials? The chemical DEET will react as a solvent to some synthetic fabrics, plastics, leather, furniture and paints. (See package labeling.) Most nylon materials are not affected by DEET. Just to be safe, you should test an inconspicuous area on the fabric. Natrapel 8 Hour is a non-deet alternative that does not damage fabric or gear. How many sprays are in a 4 oz. bottle of Ben’s 30 Tick & Insect Repellent in a 1.25 oz bottle? Approx. 400 sprays in a 4 oz. bottle and 125 in a 1.25 oz. bottle. When does my Ben’s Tick & Insect Repellent product expire? US Ben’s Tick & Insect Repellent products do not have an expiration date because Ben’s Tick & Insect Repellent products contain deet which will never expire. County & Municipal Supply Program Tender Corporation’s County and Municipal Supply Program was established last year to assist various governmental agencies who have responsibility in the areas of vector-borne diseases and mosquito abatement by supplying their Ben’s 30 DEET tick and insect repellent at special prices. Ben’s 30 is 30% DEET. Tender Corporation has developed a water-based formulation which they believe offers advantages over typical alcohol-based repellents. Because it contains no alcohol, it does not open the pores of the skin when it is applied and it does not evaporate so readily. The result is longer-lasting protection. Under their County and Municipal Supply Program they are offering special pricing on Ben’s 30 pump in a 1.25 oz bottle packaged 144 bottles to a case. * If you have any questions, please call Tender Corporation toll-free at 800-258-4696. About Tender Corporation Tender Corporation headquarters is located in the heart of the White Mountains in Littleton, New Hampshire. The company was founded in 1975 and manufactures the world-famous insect bite treatment, AfterBite, a full line of well-known insect repellents such as Ben’s and Natrapel, first-aid such as Adventure Medical Kits and Easy Care First Aid kits, survival products with Survive Outdoors Longer and burn remedy products such as AfterBurn. Many of Tender’s products are packaged in innovative ways that allow them to be convenient to use as well as environmentally friendly. Here at Tender, they pride ourselves on producing products of the highest quality, providing the best sales and service for their customers as well as creating value for their employees and their community. they see their employees as their greatest asset and strive to build a strong united team in order to accomplish their goals as well as achieve their vision; to enjoy the outdoors in every condition. they place a strong emphasis on work ethic, quality assurance and efficiency which they feel are important in creating a successful business and work environment. Adaptability and change are two concepts that Tender Corporation also strongly embraces. they feel that being nimble and flexible is important to their business and their working environment. they are made up of many different cultures, backgrounds and styles which when combined have proven their success. To this end, Tender Corporation will also strive to adapt and improve as the need arises in order to continue their growth and success for the benefit of their customers, their employees and their community. Tear open sachet near notched end. Remove and unfold wipe (towelette). Apply to all exposed skin. Apply sparingly around ears. Wash hands after applying. Do not use under clothing. Avoid overexposure. Frequent reapplication and saturation is unnecessary for effectiveness. Do not apply to eyes, mouth or to the hands of young children. Do not allow children to handle this product. Apply product to your child yourself. Reapply as necessary or after swimming or showering. Apply this product second if used in conjunction with a sunscreen product. After returning indoors, wash treated skin with soap and water. Tender Corporation is a family owned and operated business located in the heart of the White Mountains in Littleton, New Hampshire. Founded in 1975, the firm manufactures the world-famous insect bite treatment, AfterBite, and a full line of well-known insect repellents, first-aid and burn remedy products. Many Tender products are packaged in innovative ways that make them convenient to use as well as environmentally friendly. Here at Tender, we pride ourselves on giving back to the community and groups that support causes that complement our company’s values and mission. In an effort continue to support causes that we believe in, we donate thousands of dollars worth of product each year to local, regional and national non-profit groups.